For Justin, growing food and cooking have always been intertwined. After a conventional upbringing in Wilmington, Delaware, Justin discovered cooking during a year off from college while working on an organic vegetable farm in Pennsylvania. Wanting to cook in a way that honored the quality and integrity of the vegetables he was helping to raise, he began a serious study of the writings of Marcella Hazan, and her classic work The Essentials of Classic Italian Cooking became the foundation of his own philosophy of cooking. Dillon grew up in Baltimore, Maryland and Northeastern Pennsylvania, and was a serious student of the violin and acting. She met Justin at St. John’s College in Annapolis where, in their spare time, they performed as a violin-and-piano duo. They were married in 2004 and traveled to the Emilia Romagna and Lombardy regions of Italy in 2005, spending a summer working on farms and cooking with their host families. After several years of teaching Latin in private schools, Justin staged at Osteria Pane e Salute in Woodstock, Vermont, an experience which convinced him to recommit to agriculture and cooking. In 2007, Justin and Dillon purchased a small farm in Northeastern Pennsylvania. Having been inspired by their travels, they decided to recreate a model they had seen abroad: a restaurant as an organic outgrowth of a farm. The vegetable farm, restaurant, and cooking classes began as a part-time effort, becoming a full-time commitment in 2014. 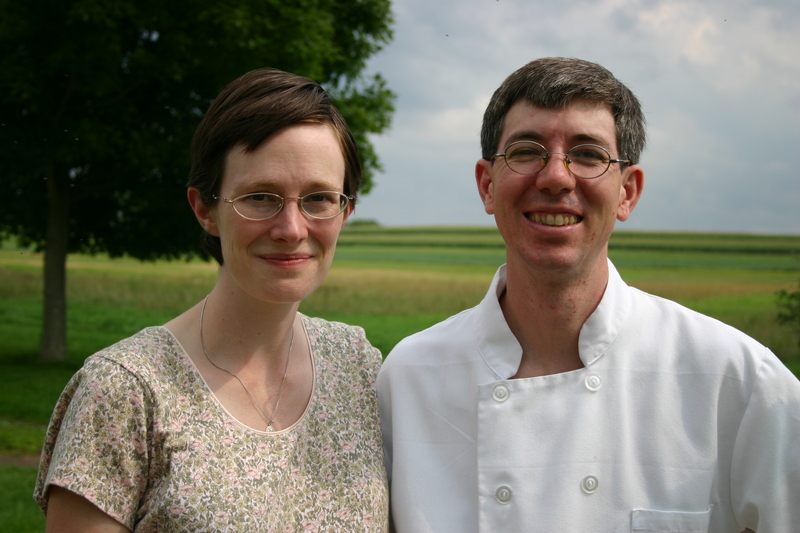 Today at Old Tioga Farm, the Naylors raise vegetables for 30 families on about an acre and operate a tiny on-farm restaurant, seating 18 guests every Friday and Saturday evening. Justin’s approach to both farming and cooking is the same: to produce the most nourishing and delicious food possible, food which is elegant but straightforward and lacking pretension. At the restaurant, Dillon manages the front of the house and is responsible for the ambiance and elegance of the dining rooms. She maintains a carefully curated musical playlist for the restaurant, and loves facilitating the fellowship that comes from sharing a meal in a memorable setting. Justin teaches cooking both at the farm and also in Italy. Every March in Rome and every November in Bologna and December in Venice, he offers small groups of clients a week-long culinary adventure with daily cooking classes, restaurant meals, and cultural excursions. Justin also keeps alive his interest in teaching through speaking engagements on diverse topics such as agriculture, ancient Greece/Rome, parenting, and homeschooling. The Naylors are proud parents of three children, and happy to be raising them in close proximity to Dillon’s mother, who is an invaluable presence in their lives.